Dropping files to the main image is very handy, but there are some other ways to use DropIt – even without requiring the application to run in the background. The easiest way is using the SendTo menu. To enable this feature, you have to check the “Integrate DropIt in SendTo menu” in the Options. There are two alternatives: Permanent and Portable. If you select Portable, than this feature will be available only if DropIt runs. Choosing Permanent will enable the SendTo feature even after closing DropIt. This may come handy if you are using DropIt on your home machine, where the location of DropIt is constant. 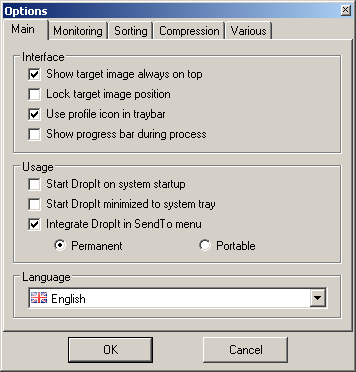 To send files to DropIt, select files (or folders), and from the system right-click menu click SendTo item. You will see that all your profiles are listed there – click on your desired profile and let it go. Note: if you wish to leave no traces on the computer (e.g. using DropIt on a shared machine, at school, or simply to keep your computer as clean as possible) do not select the Permanent option. The beauty of this is that you can assign a hotkey to the shortcut, so you can run the profile by hitting a key combination. This is simple: drag DropIt.exe to an empty space on Total Commander’s button bar and a shortcut is created. Now right-click on this new button and select “Change…”. In the dialog box type “%P%S” to the Parameters field. This will pass paths of selected files to DropIt. 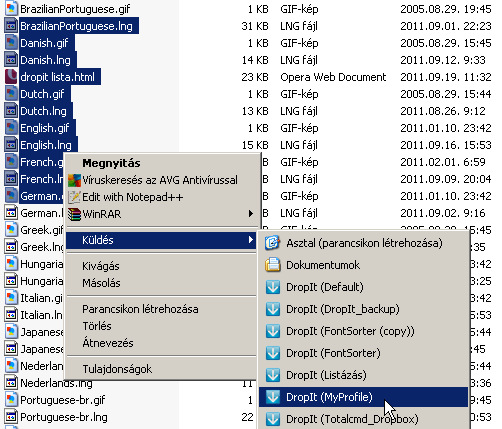 Now if you select files in Total Commander and then click on this button, DropIt will ask you for a profile and will sort your files. To further polish this button, you can specify the profile to be used. Add your profile name at the beginning of the Parameter field, so it should read “-MyProfile %P%S”. Now you can create buttons for your most used profiles and use them without DropIt running in the background. Looking forward to the pictures/examples here match with DropIt 6.1. Thanks. This is great information.